Windows 10 Fall Creators Update, codenamed Redstone 3 (RS3), the forth major feature update for Windows 10, has reached the RTM (release to manufacturing) milestone, ahead of its general availability to the public on October 17th, 2017. The RTM version of Windows 10 Fall Creators Update, aka Windows 10 version 1709, has build version number of 16299.15, with full build string of 16299.15.170928-1534. Microsoft initially rolled out Windows 10 Build 16299 to Windows Insiders on the Fast ring on late September 2017, and subsequently to Windows Insiders on the Slow ring two days later. 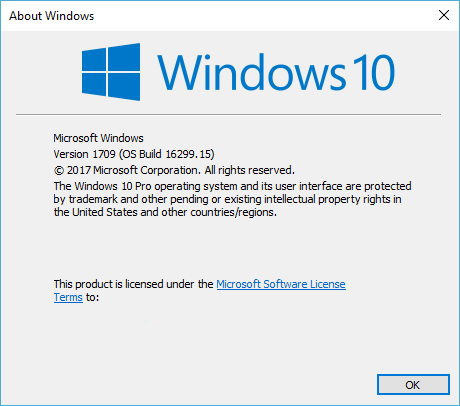 However, on early October 2017, Microsoft dropped Windows 10 Build 16299.15. Even though the increase in minor build version is normally achieved via updates delivered through Windows Update, in this case via cumulative update KB4046355 (which is also the first cumulative update for Windows 10 Redstone 3 branch), Microsoft decided to release the complete Windows 10 Build 16299.15 that requires full build download to upgrade to Windows Insiders on all Fast, Slow and Release Preview rings, and start servicing build 16299.15 with the Cumulative Updates, bug fixes and security patches via Windows Update. In a break from tradition, this essentially makes Windows 16299.15 as the RTM build for Windows 10 Fall Creators Update v.1709. It’s likely that Microsoft continues to release cumulative updates to bring minor build version higher than 15 before or on the general release day. However, build 16299.15 is likely to be the one that made into ISO images, burnt to retail DVD discs and pre-loaded onto new PCs by OEM system builders. Windows 10 Fall Creators Update brings some new features such as OneDrive Files On-Demand (which is essentially the popular OneDrive placeholders that was canned by Microsoft), Paint 3D, ePub and eBook support in Edge, My People for pinning contacts to Taskbar, improvements to the onscreen keyboard, ability to individually controlling the volume of WP apps, updated File Explorer context menu and more. Microsoft has not released the official Windows 10 Fall Creators Update Build 16299.15 ISO images yet. However, the ESD files for the build have already available on the Windows Update, and you can easily convert ESD to ISO. Can’t wait to get the Fall Creators Update? If you’re already a Windows Insider, head to Settings -> Updates & security -> Windows Update -> Check for updates. If not, join Windows Insider program. Once Windows 10 Fall Creators Update RS3 branch is wrapped up, the Windows Insider will start pushing RS4 (RedStone 4) builds to Insiders in the Fast Ring, which will be the same RS4 builds as those who chose to join Skip Ahead and have already started receiving RS4 builds.